Yama, "Lord of Death" and "King of the Law" unites with his consort in the vigorous pose of fierce deities. Both wear skull-studded crowns; his is a garland of severed human heads; hers is a girdle of human bone. They are supported by Yama's vehicle, a water buffalo. 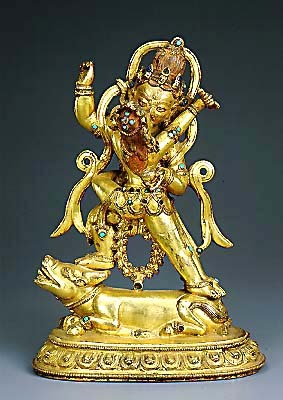 Originally a Hindu deity, Yama was eventually incorporated into the Buddhist pantheon as a protector.